Tottenham face Borussia Dortmund at Wembley in the first leg of their last 16 clash in the Champions League on Wednesday evening. Who will claim the bragging rights? This article contains our Spurs vs Dortmund betting preview with betting tips, predictions, lineups, team news, best odds, bookie offers and no deposit free bets for this game! Get 30/1 Tottenham to beat Borussia Dortmund at BetVictor. Max bet £1! New Customers only. Place a maximum £1 bet on Tottenham Hotspur to win Match Betting - 90 mins. If it wins, get the enhanced odds paid out as free bets; cashed out bets excluded. Offer valid from 09:00GMT on Tuesday 12th February 2019 until 20:00GMT on Wednesday 13th February 2019. Credit or Debit card only, minimum £5 deposit. Geographical Restrictions. T&Cs Apply. Tottenham kept their outside hopes of the Premier League title alive with a 3-1 win over Leicester. They have won four of their last five games at Wembley Stadium and find themselves in third place in the Premier League table, just five points behind leaders Spurs. In this Champions League edition, Mauricio Pochettino's men faced an uphill task to reach the knockout stages of this competition having recorded just one point from their first three group games. As to direct encounters, Spurs and Dortmund met in the knockout stages of the 2015/16 Europa League and last seasons’ Champions League group stage. The Germans won both games in Europa League but Tottenham triumphed in both occasions last year. Harry Kane and Dele Alli are both back in training, but aren't expected to feature here. That means that Son Heung Min could play as central forward, partnered by Christian Eriksen and Lucas Moura, as the Brazilian could be preferred to Fernando Llorente and Erik Lamela in attack. Eric Dier may return to the middle of the park with Moussa Sissoko potentially missing out. Pochettino is expected to revert to a back three, which would lead to Toby Alderweireld returning to the right-side of the backline. Ben Davies remains out through injury, so Kieran Trippier will play as right wing back while Danny Rose and Kyle Walker-Peters are in contention for a starting berth on the other flank. Borussia Dortmund are five points clear at the summit of the Bundesliga table but they come into this game following two disappointing domestic results. They drew 3-3 with Werder Bremen and were knocked out of the German Cup on penalties, then squandered a 3-0 lead at home to Hoffenheim in the league to draw once more last weekend. Lucien Favre's men are the Bundesliga's top scorers with 54 goals racked up in 21 games. Plus, they have only failed to score in three fixtures so far. As to the Champions League, BVB topped a Champions League group that included Atletico Madrid. They won two of their three away group stage matches, with their sole defeat coming in their toughest test in Madrid. The only other lost games inside 90 minutes all season was a 2-1 reverse at Fortuna Dusseldorf. The loss of skipper Marco Reus to injury is a huge blow so Lucien Favre could potentially opt to stick with almost the same starting lineup which he selected for the game against Hoffenheim. That would see Mario Gotze leading the line in a 4-2-3-1 system, with Jadon Sancho, Maximillian Phillip and Raphael Guerreiro behind him. Paco Alcacer is a major doubt while Jacob Bruun Larsen could replace one of the three offensive midfielders. The only change could see Dan-Axel Zagadou partner Abdou Diallo at the heart of the defence, given Julian Weigl's absence, while Achraf Hakimi could deputise at right-back in place of the injury Lukasz Piszczek. Looking for the highest odds on Manchester City vs Chelsea? 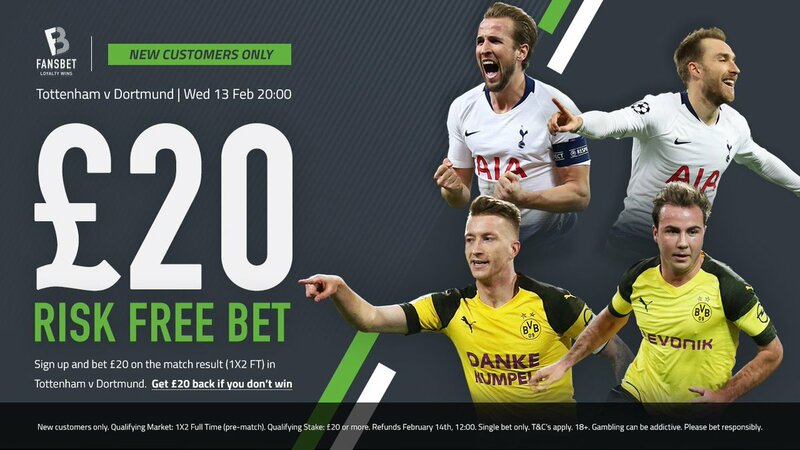 Here at BetAndSkill.com you'll always find the best prices on all the Champions League fixtures we preview and you can find below the highest on Spurs v Dortmund match winner market. Plus, we have collected all the available enhanced odds for today! 888sport offer 11/1 Tottenham or 16/1 Dortmund to win! Max bet £5! Champions League knockout matches are very tough to predict. Anyway, our professional tipsters have avery profitful record when it comes to predict the Champions League results and you can find below our free tips on Spurs vs Dortmund. If you’re new to betting, a good place to start is our Betting Guide hub, a collection of the best tutorials and betting strategies that will help you improve your skills. The Champions League is the highlight competition in Europe and there is no shortage of top online betting sites offering no deposit bonuses or promo codes to bet on the UCL. Follow us on Twitter, don't miss our wonderful offers anymore! "Spurs vs Dortmund Betting Tips, Predictions, Odds & Lineups (Champions League - 13.2.2019)"